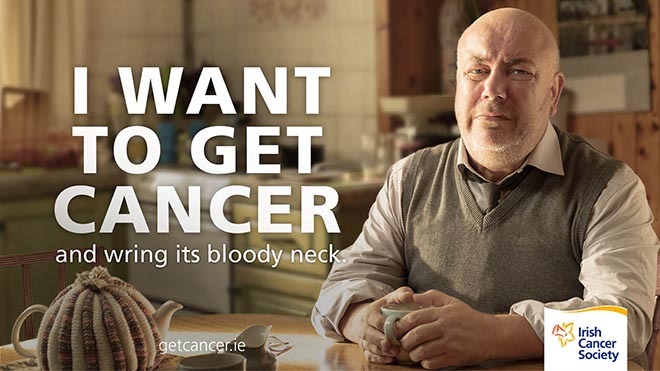 The Irish Cancer Society has launched ‘Get Cancer’, a daring and provocative new campaign, online at getcancer.ie. The campaign features a host of real life cancer survivors who state that they want to get cancer, through research, through volunteering, through funding. Opening with the arresting tagline, ‘I Want to Get Cancer’, the campaign is designed to stop people in their tracks and force them to acknowledge the disease that will affect one in two of us in our lifetime by 2020. Whilst ‘Get Cancer’ doesn’t shy away from hard and important facts, it delivers the message with optimism and strength. More people are surviving cancer than ever before thanks to improved research and development; in fact, one in four cancers are preventable. 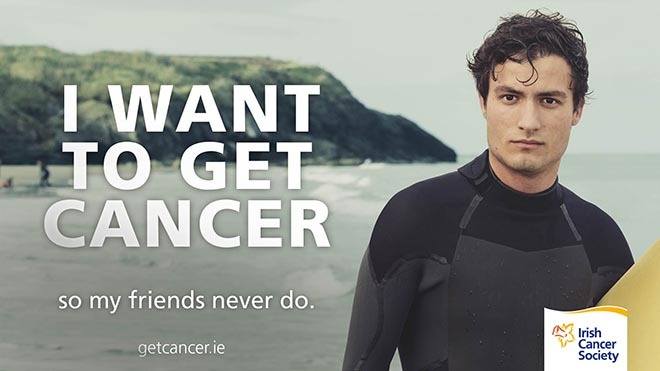 Following a number of individuals – a researcher, a young man, a daughter, a couple, and a middle-aged man – the campaign celebrates their frank and defiant discussion about the disease and highlights the support systems offered by the Irish Cancer Society, as well as the steps that can be taken to reduce the chances of developing the disease. The Get Cancer campaign was initially launched with four unbranded 10” teaser TV ads with a voice-over announcing the tagline. The these cryptic ads were deliberately intended to invoke conversation due to the ambiguity surrounding the origin and motivation behind the message. 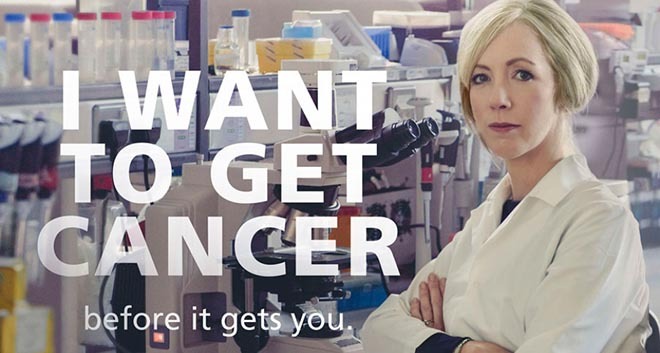 Following the strategic launch, Dublin agency Chemistry revealed that the Irish Cancer Society was behind the campaign, through the launch of a 40” TV spot, supported by outdoor, press and radio. The thought-provoking campaign has been hugely successful in translating the initial reaction into direct action. Irish Cancer Society experienced a significant increase in demand throughout its services – with The Cancer Nurseline seeing a 100% surge in enquiries from members of the public on the day of the campaign launch (compared to the daily average). Views for the 40 second advert on Irish Cancer Society’s Facebook page rocketed to 600,000 within a short 48-hour period following the launch of its new awareness campaign. The Get Cancer campaign was developed at Chemistry, Dublin, by creative director Emmet Wright, art directors Adrian Fitz-Simon, Hugh O’Connor, Fabiano Dalmácio, copywriter Mark Tuthill, agency producer Conor McGuinness, digital lead Lisa O’Brien, planning director Sinead Cosgrove, account team Ray Sheerin and Mags O’Reilly. Filming was shot by director Keith Hutchinson via H2 Films with producer Adam Sherry and director of photography Ian Murray. Post production was done at Windmill Lane by editors Vinny Beirne and Lee Hickey, Flame artist John Kennedy, base light grading artist Dave Hughes, producer Sarah O’Carroll. Sound was designed and mixed by Locky Butler. Music was by Denis Kilty.